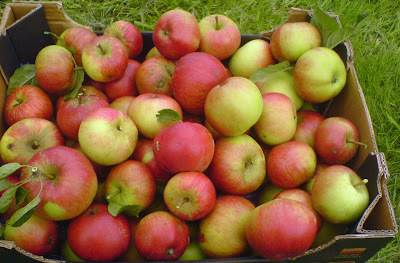 Apples are often damaged by codling moth larvae burrowing in and out of the fruit. They are also attacked by winter moth larvae and other crawling and flying insects. So this year we decided to make a concerted effort to control the bugs and hopefully improve the quality of our fruit! Do you have a stack of contaminated manure? DOW will remove it! Jon, one of the website visitors wishes to share the following information recently sent to him by DOW. 1) Approximately how much manure (either bags or estimated weight) do you have that requires collection? 2) Where is the manure located? If you do not reply it will be assumed that you do not need any further assistance with the removal of any manure. Following receipt of this information, I will contact you on behalf of Dow AgroSciences to discuss the follow up arrangements. Please note that any assistance offered is without admission of liability on the part of Dow AgroSciences or Stewardship Ltd in relation to any losses or damage which may have been caused to your crops. A website has been created to provide further information. Thank you for your assistance in this matter and assuring you of our best intentions." Please let me know if you manage to have your contaminated heap removed. 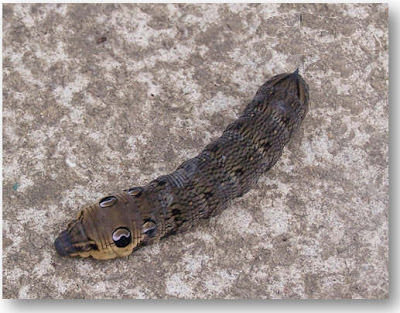 The caterpillar below was spotted on Pat and Joe's allotment and caused quite a stir as Pat held it at bay with a piece of bamboo whilst calling for help! This didn't help as the caterpillar just made itself look fiercer by rearing up in a defensive posture. It is the caterpillar of the Elephant Hawkmoth. The caterpillar below was much less fierce. The nearest that I can get to identification is the giant cucumber moth. (Please read more information under the photograph). 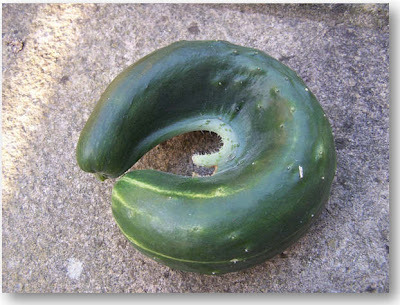 For more strange fruit and vegetables (one in particular is X-rated) click here. If you have any photos of strange fruit of vegetables why not send them to add to our collection with a bit of information about where it was grown. Short and sweet September's diary has been updated. Our plot neighbours, Pat and Joe, have had a really successful year in more ways than one. 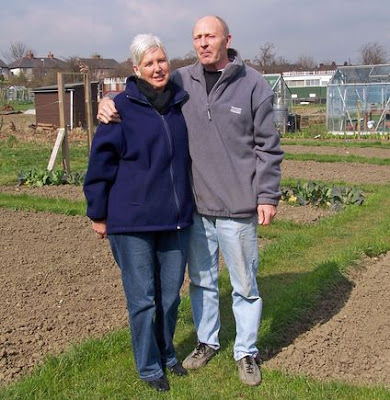 They have just heard that not only have they won 1st prize in the Ossett/Horbury area senior citizen category but have also won the overall gardener of the year in the Wakefield district allotment garden competition. Pat and Joe have won the senior competition each year since they took on their plot almost three years ago but this is the first year that they have gone on to greater things. Well done to them! To view some photos of their plot click here. So what has happend to September's diary? You may have noticed a lack of updates to the September diary as we have been on holiday for as week or so. September is a fairly good month to leave the plot which with help from some good neighbours has managed well without our attentions. Our thanks to our watering friends. We spent a week near Exminster in Devon staying in a chocolate box thatched cottage with a huge garden. It was also - weatherwise - maybe one of the best week's of summer. I'll catch up with the diary as soon as I can. It's September! How did that happen so quickly? September has continued the theme of strong winds and rain. Yet another cardoon has been battered to the ground. Work on the plot has been frequently interrupted by sudden heavy rain but despite that we have managed to spend some time on the plot. A couple of young hedgehogs were spotted browsing under the bird feeders. I just hope these will grow to a size that will survive hibernation. To read the first entry of the September diary and view a film of cute baby hedgehogs click here. After reading the section for manure suppliers on the ManureMatters website a couple of statements made me wonder so I put a couple of questions to DOW. There was only mention of animals grazing and not that aminopyralid could have been used on bedding material. The most commonly used bedding material for UK livestock is straw derived from cereal crops such as barley or wheat. No products containing aminopyralid have been developed for use on cereal crops grown in the UK. No products containing aminopyralid have ever been approved for use on cereal crops grown in the UK. Therefore, no cereal crops grown in the UK should have residues of aminopyralid derived from direct application to those crops. If manure generated by livestock fed on forage from pasture treated with aminopyralid is applied to land prior to establishing a cereal crop, the straw from that cereal crop will not contain residues of aminopyralid in sufficient quantities to cause problems to sensitive crops. If the suspension of the approval of products containing aminopyralid is lifted, the new product label will not allow application of manure that may contain residues of aminopyralid to crops other than grassland, thereby removing this concern. Dow AgroSciences has developed a test to check whether manure or compost contains residues of aminopyralid. (See "What can I do" in the panel on the right). (The test in the panel is the now well known broad bean test). Isn't it a bit dodgy advising manure suppliers that if they run the test DOW recommend then the manure is safe? This manure test has been put in place as a simple procedure for manure suppliers to check whether residues of aminopyralid might be present in their stocks of manure. A positive result would obviously indicate that the manure should not, under any circumstances, be supplied to gardeners or allotment-holders. A negative result does not guarantee the suitability of the tested batch of manure for use in gardens or allotments, but could be used as additional information when trying to establish the provenance of that manure. Questions about the source of the manure, and forage within the manure, should always be asked in conjunction with carrying out the test. The test alone should not be relied upon to guarantee the provenance of manure supplies. 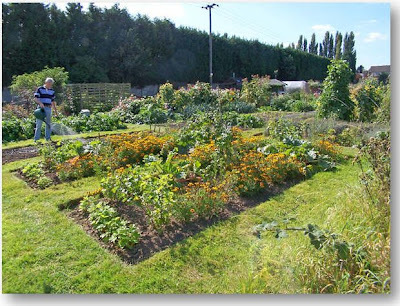 Gardeners and allotment-holders must always satisfy themselves, as much as possible, as to the suitability of the manure they are planning to use. I thought that next year I'd like to plant some crocuses (or is it crocii) in my garden to add to the early spring colour and so I have been browsing the Internet and watching out for the inevitable catalogues that pop through the letter-box. One such catalogue was from Spalding bulbs so I decided to check out their web site to get a bit more information of what was on offer. Click on the image to access the offer shown above. 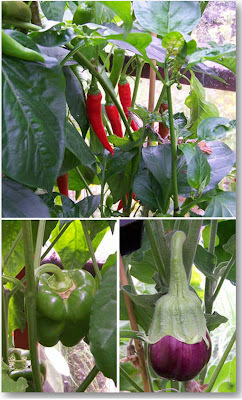 The last week in August was wet, wet and wet - and windy but we did manage to put in some time on the plot. The latest photo album has also been added. I was asked by a contact why when they had signed the above epetition had their name not appeared on the list of signatures. I guess he didn't verify his account as sometimes the verification email goes into a junk folder. If it has happened to one person then it is likely to have happened to other people. When you sign up to an epetition an email is sent to the email address that you gave. You have to verify this in order for your name to be added - it just needs you to click the link in the email. The problem is that some email accounts send the message into the junk or spam box. (Obvious don't like anything that comes from the government). If you have signed the latest petition then please check that your name is on the list and if not check your email including junk box for a message that is from 10 Downing Street. If you can't find an email then please sign up again.